On a somewhat overcast afternoon on 25th November 2015 Gwen Richards and I did a circuit of Little Assynt, taking in the Loop and Ken’s paths’. Our observations were sparse, but nevertheless interesting: a few molehills, apparently confined to path edges, a large spreading bush of prostrate juniper Juniperus communis nana, a stand of reed canary-grass Phalaris arundinacea at a hitherto-unrecorded site near the old settlement, two startled red grouse and a reed bunting by the replica house on Loch an t-Sabhail. More unusual was a small slug that we found climbing up a shady lichen-covered rock face on the Loop Path between Lon na Smeoraich and the Field Car-park (NC155252). It was about 4cm long, with a pale sole, a short but strong keel on its tail and a light band continuing the line of the keel along its back to the edge of its mantle. These and other features enabled me to identify it as an immature tree slug Lehmannia marginata. This species is described as the ‘archetypal slug of tree trunks’, up which it ‘may climb several dozen metres…along mucus trackways’, but it is also found on rocks and walls. It has been previously recorded in Assynt, but not often, since not many folk look that closely at slugs. Tree slugs are specialist grazers on lichens and algae. The rock face on which we spotted this one was indeed completely covered with a creamy-white lichen called Haematomma ochroleucum, which it was probably rasping off as it slid along. 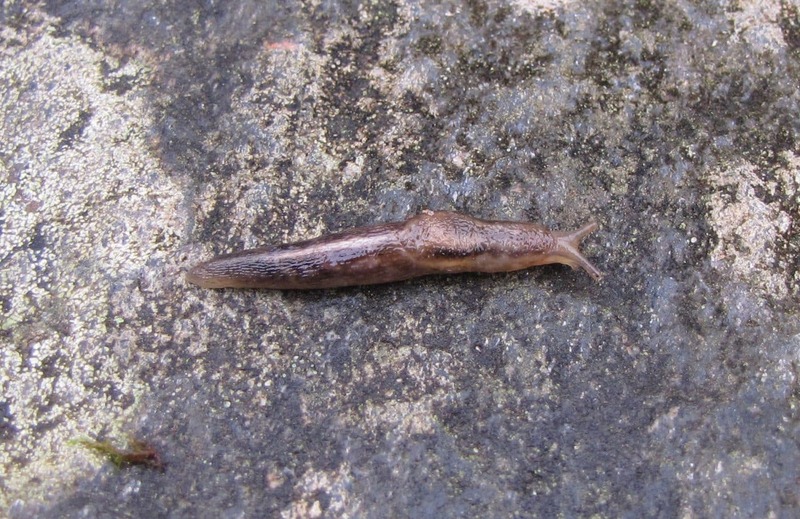 Most slugs only emerge at night to avoid dessication and predators. This individual had perhaps been tempted out on a damp day by a huge expanse of potential food; a bit like someone with a sweet tooth faced with an iced cake the size of a football field?